Peak Oil bereits überschritten ? In this post, we use a graphical approach for analyzing oil production since 2001. This analysis shows that more and more countries are showing declining oil production, and that this decline in production is not being offset by increases in production elsewhere. 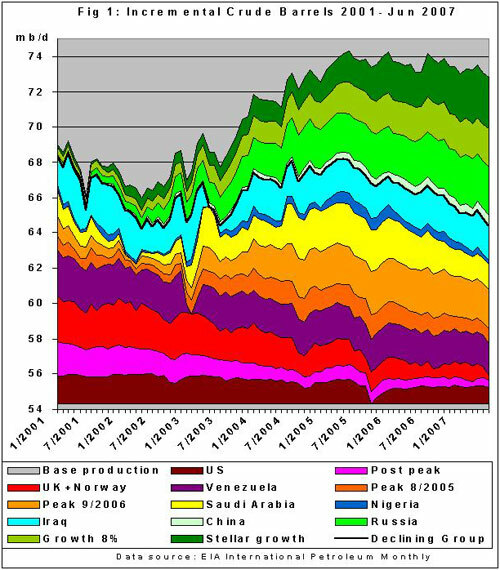 If this pattern continues, this analysis suggests that we may already be past the peak in world oil production. Die zurückliegenden 10 Oktobertage legten eine ungebremste Preisrallye auf die Notierungs-Boards. Sowohl für die Leitsorten, wir auch für den OPEC-Basketpreis wurden neue Allzeit-Rekordpreise festgesteckt.